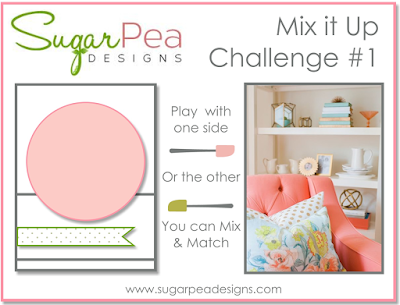 It's time for another awesome challenge from SugarPea Designs and this week we are starting something new and exciting in our challenges! You can choose to use either the sketch or the inspiration photo or you can combine both! How cool is that? I decided to sort of mix it up but I focused mainly on the photo as I was drawn to that gorgeous cushion and the peach-colored chair. 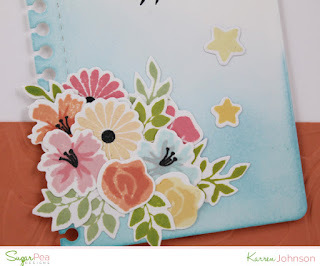 I stamped and die-cut heaps and heaps of the cute little flowers from Funky Wreath Spring Addition and arranged them into a bouquet with the help of Press n Seal. I then put the bouquet to one side while I worked on the rest of the card. The angled panel was die-cut with the biggest die from Notebook Journal Card and lightly sponged with Tumbled Glass ink. 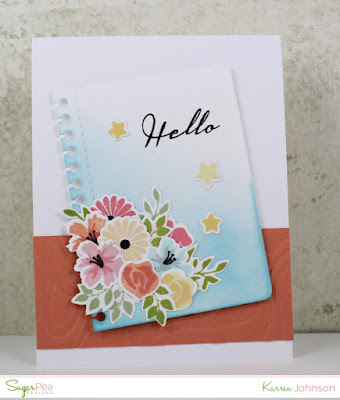 The sentiment comes from Pineapple Paradise - love the font on those sentiments! To finish off the card, I used a Sizzix embossing folder on a strip of Melon Berry cardstock and adhered it all to a white card base. Upload to your blog or other Online Gallery using Keyword: SPDSS56 so that we may check out your beautiful work. absolutely gorgeous... love how you used the colors and beautiful flowers!! The softly colored background just makes your beautiful flowers pop! Wonderful card, love all those flowers. That press n seal is brilliant isnt it. Love your design, so eye catching.